Today when we went on our annual trip to get a photograph with Santa Claus at the mall, I realized that this is the last year we’ll be making such a pilgrimage. When we got there, I was quickly reminded of last year’s experience where Santa Claus continued to stumble around, making it apparently clear that he was drunk and it was only 11 o’clock. 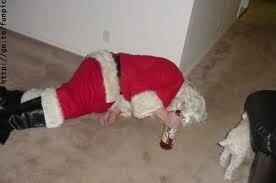 This year, Santa seemed sober, only for Mrs. Claus to take his place at the throne of Mall Drunk. For thirty minutes, we stood in line waiting for our turn and I watched her as she stumbled around, her eyes even rolling once. When in close proximity, the smell of whiskey sour was so overpowering I was legitimately concerned that if she were to belch, the Christmas candle lit next to Santa’s chair would actually ignite the entire mall. At first, I couldn’t really pinpoint why “drunken debauchery” always seems to come of dressing as the fictional couple. But then I began to look around. The mall decided that instead of a really big Christmas tree that you get to walk under as you go up to the platform where Santa and Mrs. Claus are waiting, this year they went the more traditional route and installed a nativity scene. 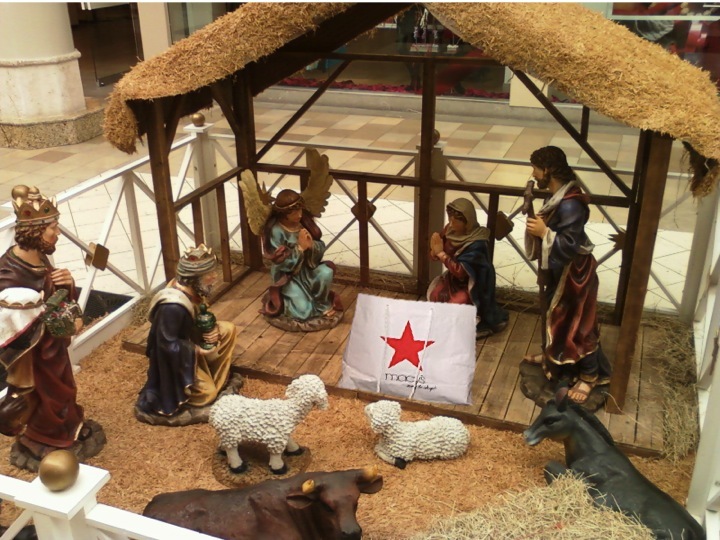 It was your standard, run of the mill, life-sized nativity set, only in the place of the baby Jesus was a Macy’s shopping bag. Really? I thought to myself as we rounded the corner to the last leg of the never-ending line to sit on the fat guy’s lap and be on our way. Yes: really. I’m sure Mrs. Claus (and last year – Santa, himself) wasn’t actually drinking because of the sheer consumerism of the Macy’s bag-Jesus nativity set (well, if they are anything like me they might be…). But beyond that, as I looked around while standing in line to pay $38.95 for five minutes and three photographs, I saw the utter humanity baring itself for all to see – a sight usually only reserved for Disneyland and funerals. There were people arguing in line about what picture package they were going to get – because they had to make sure to send photographs to every single goddamned relative that expected one. This raises other issues that are beyond the scope of this blog, but as to the bizarre-factor of this situation, one couple actually began to scream at each other. Not talk in raised voices, not yell – actually scream. I was surprised the mall cops didn’t show up (although when have mall cops ever actually policed the mall?). Further down the line, there was a pregnant woman who looked like she was actually going to give birth right then and there waiting to take her 2 year old son to visit Santa Claus. I don’t know if I have ever seen someone so pregnant before. She kept rubbing her gargantuan belly and moaning – at one point she kneeled and I almost fainted at the thought of her birthing right then and there. Children were screaming everywhere. Some were wearing their pajamas still (which seemed ludicrous at roughly $13 per 4X6 print – but who am I to judge?). 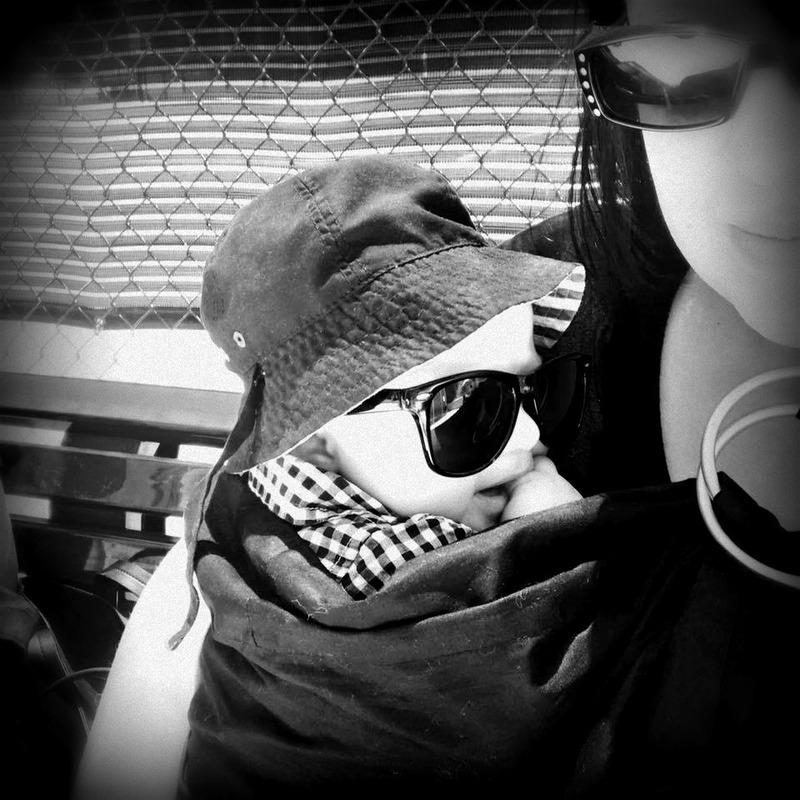 In the time we stood in line, my feet were smashed by some lady’s stroller no less than five times and I set my hand on the banister holding the line together once to learn a child had been gnawing on it (leaving my hand slobbery with some stranger’s spit). In the end, standing in line for thirty minutes had my own mouth salivating at the thought of drinking heavily upon returning home. If I had to stand there for eight hours a day, pretending to be happy about the most material, consumeristic, and generally fake holiday of the year; all the while wearing an outfit that is hot, itchy, and absolutely ridiculous, and being put in the position of having to allow strange children to stomp on, hit, and kick me for the sake of this grand, holiday charade – I would probably be drinking before work every day too. Actually, I would probably start every day off with a whiskey sour and a handful of Xanax. So drink on, Mr. and Mrs. Claus. Drink on. But we’ll be staying at home next year. The Macy’s bag position is hilarious haha! Hilarious … as well as disturbing!! HAHA!! I love it this is classic you have to post the actual santa photo as a pay off I am dying to see! Even if you have to blur eveyones face but Santa’s its classic!